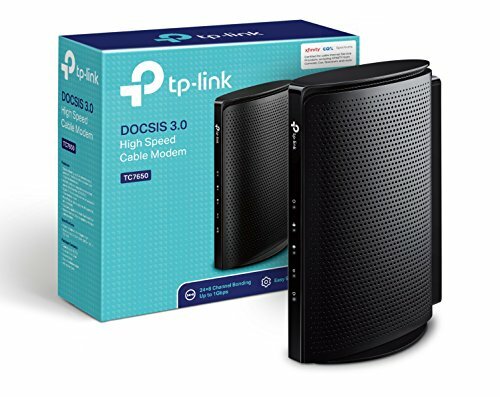 TP-Link TC7650 DOCSIS 3.0 (24x8) High Speed Cable Modem. Max Download Speeds Up to 1000Mbps. Certified for Comcast XFINITY, Spectrum, Cox, and more. The TC7650’s Cable Labs Certified DOCSIS 3.0 technology allows TC7650 to deliver speeds 24x faster than DOCSIS 2.0.The modem features innovative 24x8 channel bonding providing data rates up to 1029 Mbps for downstream, and 206 Mbps for upstream.That makes streaming HD Video, gaming, shopping, downloading, working, high-quality voice and video conferencing, and peer-to-peer networking applications far more realistic, faster, and efficient than ever before. Industry leading 2-year warranty and free 24/7 technical support. Lightning Fast Speed: Channel bonding of up to 24 downstream and 8 upstream channels; Best for watching 4K movies and online gaming.